Valerie, when I saw the announcement for your book, Secret Thoughts of Successful Women, I was so excited, I placed an order for it before it was even published. Boy, was I not disappointed. I felt as if you were speaking to me personally. The book was amazing in its insight and in fact has now made my company’s success possible. In my previous “day job” I was a an accomplished senior manager and technologist in the engineering field for over 30 years. You would think that track record alone would clue me in to the fact that I had a right to be in this field. But, engineering has always been a man’s world. I was sure someday ‘they” were finally going to find me out as the “impostor” I was and ship me out on a rail. In addition for years I had been dreaming about work for myself. Unfortunately, all of my prior attempts to be a self-bosser were less than satisfying. Yes, I could teach sewing or walk dogs, but for some reason, I wasn’t passionate enough about those endeavors to keep my interest long enough to see success. I liked engineering. But, opening up my own successful engineering company seemed so out of reach to me. I had started the framework for one anyway, but kept dragging my feet. In fact I had even walked away from it. In my second attempt, I was even getting a few small contracts, but nothing that would look like it would sustain my being able to work for myself for any length of time. I still had the nagging feeling that women don’t build engineering companies. Men do. The funny thing is, I have a Masters in Leadership and Organizational Behavior sciences. I am a human behavior junky. I had never heard about any thing called the “Impostor syndrome.” Boy had I wish I had issue known about this sooner. 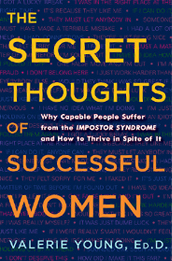 After reading the book “Secret Thoughts of Successful Women” and seeing that all of my fears were really the Impostor Syndrome at work, I realized that I had been saying “NO” to my own success all along, and didn’t need to. In fact, just after I finished reading the book, I was able to go to the next hairy scary big time conference, rolling with the “Big Guys” and land a huge contract and exclusive alliance with a very lucrative client company. This relationship will definitely go a long way to ensure the continued success of my company for years to come. I can now finally realize my dream and become become a self-bosser. How was this relationship different from all the other business relationships I have entered into in the past? Not only was the scope of the project much larger than any I could have possibly imagine handling in the past, the company I entered into the alliance with is located in Europe. Before reading your book I would have come with all sorts of excuses why I could not help this company. I don’t know how to work with someone in Europe. I don’t how to how to set up foreign money exchanges. I can’t possibly handle such a big project, etc. etc. etc. I would have been shaking in my shoes and may have turned the project down even. Your book made me realize I had the core expertise they were looking for and I don’t have to know all the information I need to work with these people right now. I just have to learn it. And in fact, now that I have opened myself up to the possibilities thanks to you, the resources to teach me what I need to know are coming forward just in time. Now, I realize all I have to do is just say “YES” to the opportunities as they come to me. I highly recommend anyone with fears of “playing big” holding them back, read this book. The book is easy to read and effective in its suggestions on clearing out any fears or unhelpful notions you might have. Thank you Valerie for writing this book! I’m thrilled and humbled to know that my words have helped shift your thinking and to play BIG! Looking forward to hearing about all the great things that are sure to come.